Oy, well it seems that we miscalculated a bit with the Wild Things Round Up again this month. When we selected elder flowers as the featured herb, I knew a nearby tree had flower buds which were green and the size of pencil erasers. I thought for certain they'd flower before the end of the month. No such luck. Thankfully, Bek sent me some dried elder flowers, so that I'd at least get to try making a recipe with them. Trouble is that Memorial Day weekend is a very busy time for me, work-wise. So, this recipe came about because I needed something quick and easy, and using what I already had at hand. I've been picking quite a bit of salsify lately, so that was what I reached for. Some say that the roots of salsify taste like oysters, and I have no idea where that comes from. To me, they taste rather like parsnips, without the carrot/parsley vibe going on. You know, blandly sweet and root-y. 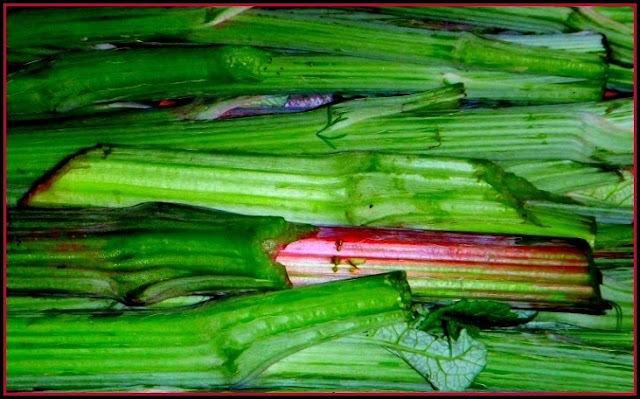 They are a nice veg to have around, and add variety to spring's usual offer of greens. 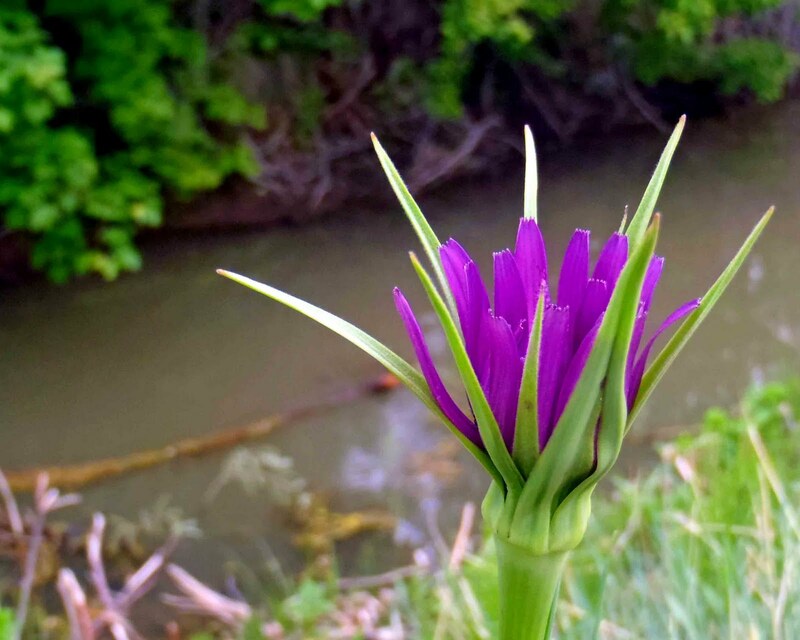 Salsify has some dangerous lookalikes, so harvest mindfully. What I usually do is look for the easily recognized flowering heads, which can be either yellow or purple. Then, once I have that visual of what the plant looks like, I search the surrounding area for salsify plants which do not have flowering heads, because those are the best for eating. Even these young plants exude the characteristic milky sap. 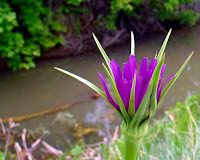 Mostly, I just eat the roots of salsify, but the buds and young shoots can also be eaten. Prepare your salsify roots by washing, peeling, and cutting into 1" sections. Place your chopped salsify root pieces into a pan on medium heat, along with a spoonful of lard, and enough water to just cover the bottom of the pan. Cover, and let simmer until tender, at which point the water should be evaporated. Remove the lid, and let the tenderized salsify roots continue to cook in the lard until the take on a golden brown color. 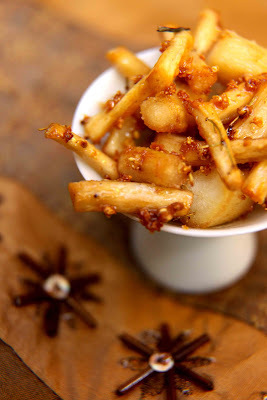 When the salsify roots have reached a nice brown color, drizzle them with elder flower-infused honey (or plain honey and fresh/dried elder flowers), continue cooking for 30 seconds. Season with salt and pepper. 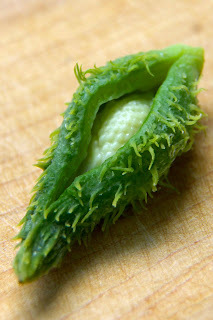 This recipe is a part of the Wild Things Round Up. Do you have an elder flower recipe that you'd like to add to the round up? Please send the link to wildthings.roundup@gmail.com right away. I'm also sharing with Real Food Wednesday, and Hearth and Soul Hop. New to me as always. Thanks for sharing with Hearth and soul hop. It's always good to have a few root veg in your repetoire, and even better if you can get them wild. Just be prepared for the fact that wild roots tend to be smaller than anything you'd buy at the store.